This paper analyses economic developments in the eurozone since its inception in 1999. In doing so, we document a process of economic divergence and polarisation among those countries that joined the eurozone during its first two years, which fits a typical ‘core – periphery’ pattern. We show how this polarisation process first manifested in increasing current account imbalances before the crisis, before it translated unto the level of general macroeconomic development after the crisis. 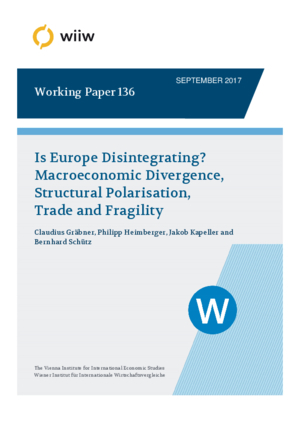 Empirically, we demonstrate how this divergence is tied to a ‘structural polarisation’ in terms of the sectoral composition of eurozone countries: specifically, the emergence of export-driven growth in core countries and debt-driven growth in the European periphery coincides with differences in technological capabilities and firm performance. Pushing for convergence within Europe requires the implementation of three intertwined policy programmes: macroprudential financial regulation, active industrial policies aiming at a technological catch-up process in periphery countries, and progressive re‑distributional policies to sustain adequate levels of aggregate demand throughout the eurozone.